If you’ve ever been unlucky enough to spend some time with me, you are probably aware that one of my favorite sayings is, “If you ain’t gettin’ weird, weird is gettin’ you.” And, it is upon that basis that a few years ago, I began to take to experimentation with blending my own whiskeys at home. If you are one of those folks who believes that each whiskey you buy should be drank neat, then you’ve got to expand your horizons, my friend. And, as opposed to leaping straight into making Laphroaig cocktails, why not do some dabbling with homemade blends (especially around the holidays when you’ve got all sorts of in-laws blowing up your spot)? The biggest reason I started working with homemade blends is because of whiskeys that I was not the biggest fan of on their own merits, but saw potential in their flavors. The first ever blend I created at home (and I always recommend starting with a glass and then working up to a full batch) originated from my having a bottle of Willett rye that was a little hot for my tastes, with some heavy herbal notes that were not my favorite. To be sure, this Willett was not bad whiskey, merely not my favorite. So, to bring in some sweetness, but not too much, I created a glass of whisky with 1.5 ounces each of Willett rye and Wild Turkey Rare Breed. The result was a fantastic dram, but big vanilla and spice, backed by a whispering herb garden. I was hooked on blending. My favorite blend that I have ever made came out of the search for good uses for Balcones Brimstone, a Texas Scrub Oak whisky that resembled a mix of gasoline and barbecue sauce. The flavors were intense and powerful, but hot and unpleasant (it turned out to be a great cooking whiskey, too, but more on that in another post). At around this same time, somebody gifted me a bottle of Old Crow Reserve bourbon, hardly my favorite bourbon, but decent bourbon at $15/bottle. I started teaspooning full measures of Old Crow Reserve with Balcones Brimstone, and magic happened. The result was a bold, brash, and balanced whiskey wafting back and forth between spicy, earthy notes, and sweet cereal flavors. If you’ve ever thought sweet corn would taste good smothered in caramel and a Cajun dry rub, this was the blend for you. Not every blend I have ever tried has worked out, but not every person you date ends up being your spouse, but that’s why you date them. The reason I blend whiskeys at home is because whiskeys are like people – sometimes that friend of yours growing up that always gets the group into trouble just needs to find the right person to be with to smooth out those rough edges and create a masterpiece. Happy blending, y’all! Let it ride! I am capping off my little mini-series on American craft whiskeys with one of my very favorite whiskies, Balcones Texas Single Malt Whisky. This whisky is made from malted barley that is mashed, fermented, distilled, and aged at the Balcones Distillery in Waco, TX. Like most Balcones whiskies, there is no age statement on the bottle, but that is not a case of Balcones trying to hide bad spirit. This is truly a case of Balcones bottling their products when they are ready. Like most Balcones products, their single malt is bottled in small batches (this is batch #SM12-9) and without the use of coloring or chill-filtration. 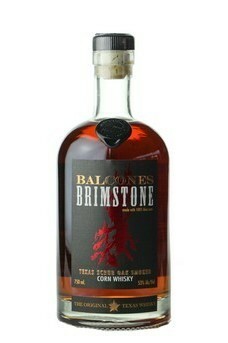 Like the Balcones Brimstone, Texas Single Malt is bottled at 106 proof (53% abv). 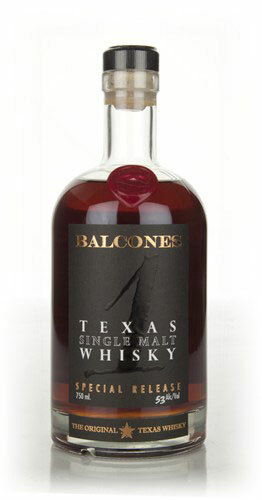 In the glass, Balcones Texas Single Malt Whisky is a rich, deep mahogany color. The nose is a classic single malt, but wholly unique at the same time. It reminds me of rich, freshly baked banana bread, with the balance of toasted sweet breads, bananas, walnuts, tangerines, chocolate pound cake, and a light whiff of cinnamon spice. The nose on the whisky is unbelievably delicious. The palate is medium to full-bodied, fruity and buttery, with notes of pears, strawberries, cinnamon sugar, and toasted bread. The finish is warming and relatively long, with some spiced oak, cinnamon, and vanilla custard. Overall, this whisky is absolutely brilliant. It is unlike anything else on the American whiskey scene today, truly in a class of its own. It is sweet, fruity, malty, spicy, and lightly wooded. Everything you would want from a single malt whisky is present, and yet this whisky sneaks into the realm beyond words. It also opens up beautifully in the bottle and with a few drops of water. It is slowly becoming more readily available, but still not the easiest whisky to find. Snag a bottle if you see one. My grade: A-/A. Price: $50-60/750ml. This is a little pricey for its youth, but the juice in the bottle is worth every penny. Balcones is definitely doing some great stuff with whisky, and letting it ride! In continuing my thoughts on some American craft whiskeys, I am reviewing Balcones Brimstone, a whisky (Balcones does not use the “e”) made with 100% blue corn. Balcones is a distillery out of Waco, Texas that has quickly swept the American whiskey scene with its innovative, brilliant line of whiskeys and whiskey liqueurs. The subject of today’s review is Brimstone, a whisky made from a mash of 100% blue corn and smoked with Texas Scrub oak. Chip Tate (master distiller at Balcones) has kept his secrets regarding this whisky under wraps very well, but Brimstone is smoked differently than most peated whiskies coming out to Scotland in that Balcones smokes the whisky, itself, not the grain. I suspect that this whisky is not very old, but I do not know that for sure, as there is no age statement on the bottle. The whisky is bottled in small batches (this review is of #BRM13-3) and bottled at 106 proof (53% abv). The aroma’s of this whisky come leaping immediately out of the glass, with dry-rubbed barbecue spices, burning wood, toasted corn chips, rock salt, and caramelized onions. The palate is medium to full-bodied, and it follows up on what the nose started. Sweet corn, mesquite barbecue, and a big bonfire smoke note make up what is certainly a unique palate. The finish is long, longer than most whiskies I have encountered. Seriously, try two glasses of this whisky at about 8 pm, and see if your breakfast doesn’t taste like Brimstone whisky. The finish reminds me of a combination of barbecue smoke, wood smoke, and pipe smoke, the flavor that might linger after eating some barbecue potato chips and smoking my pipe. I do not care for this whisky too much with water added, as it really thins the whisky out too much, rendering the whisky disjointed. However, I do really like blending this whisky with bourbon. Pouring a full 2 ounce measure of bourbon, and adding just a splash of Brimstone makes a delicious homemade blend that brings a great combination of sweet and smoky to bear. I love doing homemade blending, and I am always excited when a combination works as well as this one does. Brimstone is also a fun whisky to have in the cabinet because of how it bends your palate, and changes the flavor of whatever whisky you may taste after it. Overall, Balcones Brimstone is certainly a unique and innovative whisky. It is hardly a whisky that one can drink often, but there are some nights (and some foods) that go really well with Balcones Brimstone. It also makes a fantastic whisky to cook with, for all its spicy, flavorful qualities. This is well-made whisky, a trend indicative of the quality of Balcones’ products. Look forward to a few more reviews of their whiskeys here at Bargain Bourbon. My grade: B-. Price: $50-60/750ml. Even though the price is a bit steep for such a young whisky, you should give Brimstone a whirl; it is a memorable whisky experience. Let it ride!